All 100 DL500C's were built by ALCo in 1957/58. Harsh Vardhan via Mark Carter (Apr 20, 99): A few WDM1s are thought to be still in service (April 99) on the North Eastern Railway around Gonda and Gorakphur carrying out the odd shunting and pilot duties. They are also used on local sugar cane trains during the season to and from nearby industry sidings. Their mechanical condition is not thought to be good and they must be early candidates for withdrawal. 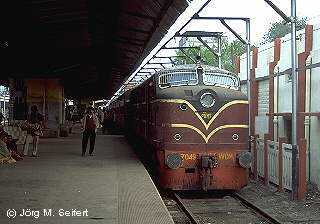 WDM1 17000 the first loco has been earmarked for preservation at Rail Museum at Delhi/ Madras. Another DL500, here spotted next to an unidentified class WG in Mughalsarai in Uttar Pradesh, 9th April 1972. The unit is a mere 14 years old at that date.